Pennsylvania has, and is trying hard NOT to have, dozens of non-native, invasive plant, insect and animal species. Worse than mere killjoys, they can threaten the livelihood of food producers and those who depend on them. They also threaten food and agricultural products and the $74.5 billion they pour into our state’s economy. What’s more, they are hazards to human health and safety, and they disrupt the natural habitat of our waterways, threatening water quality and eliminating the food supply for the fish and other animals native to Pennsylvania. Take just the three examples above. Emerald Ash Borer, a sparkly green, exotic beetle, has killed millions of Pennsylvania ash trees since it was accidently imported to the U.S., then found in our state in 2004. Dying or damaged ash trees along streets, hiking trails, and in parks can be dangerous to people below. Removing damaged trees yourself may be even more dangerous unless you happen to be a professional forester. The ash baseball bats that originate as Pennsylvania hardwoods and have long been favored by little leaguers and major leaguers alike, are becoming scarce. Spotted Lanternfly, another wildly colorful, non-native insect made its way to PA on the also non-native Tree of Heaven — the home of choice for the adult and near-adult pests — much more recently. As it develops, it hops from one woody plant to another, destroying grapevines, and trees like peach, plum, cherry and hardwoods. We love our grape juice and wine, as does the rest of the country and the world! Pennsylvania is the top U.S. supplier of concord grapes and hardwood saw timber. Unlike these other pests, feral swine are not particularly colorful. In fact, they’re ugly, menacing, and can weigh as much as 400 pounds. They carry viral and bacterial diseases that can infect and kill livestock, wildlife and pets. The diseases and parasites they carry can easily spread to humans. Feral swine are voracious eaters. They root and wallow, tearing up farmland, woodlands and streams. So, it’s not just the old swimmin’ hole they wreck. It’s also the animals, people and plants who rely on the environment they destroy and the food that is raised on the land. 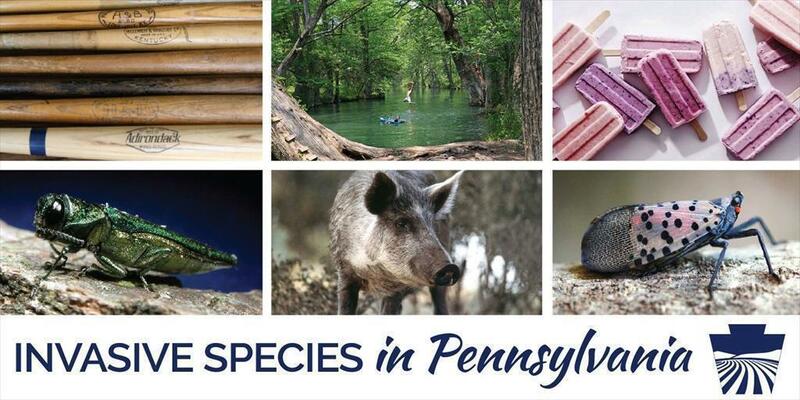 The PA Department of Agriculture works with other PA state agencies, including the Department of Conservation and Natural Resources, the Game Commission, and Fish and Boat Commission, to remove the threats presented by invasive species. We also work with PSU Extension, the USDA, other federal agencies and state governments, and with private industry. Learn what YOU can do to help eliminate pests in your area, or keep them out of your area altogether, at the links above and here​.